By Daniel R. Williams. Daniel's research won the Best Ethnobiology Poster Award at this years meetings in Madison, WI. "It's a bit like Jurassic Park," I told a greenhouse visitor while I tucked another inflorescence into a glassine paper bag. "People ate this like quinoa almost 4000 years ago. The variety grown here vanished hundreds of years ago, but with a bit of work we can bring it back." Around the greenhouse people joke that all I know how to grow is weeds. It's not precisely true, but I do grow a lot of one type in particular. Lambsquarters (Chenopodium berlandieri) is familiar to every gardener by sight if not by name. In agriculture circles, it has earned a notorious reputation for being hardy and hard to kill. Some rural Appalachian families have taken advantage of its enthusiasm, collecting leaves and stems for a variety of food dishes. Lambsquarters greens are quite as good as asparagus or spinach with a quick sauté in olive oil or as part of a salad. As good as the greens are, it's the seeds I dream of seeing on dinner tables. 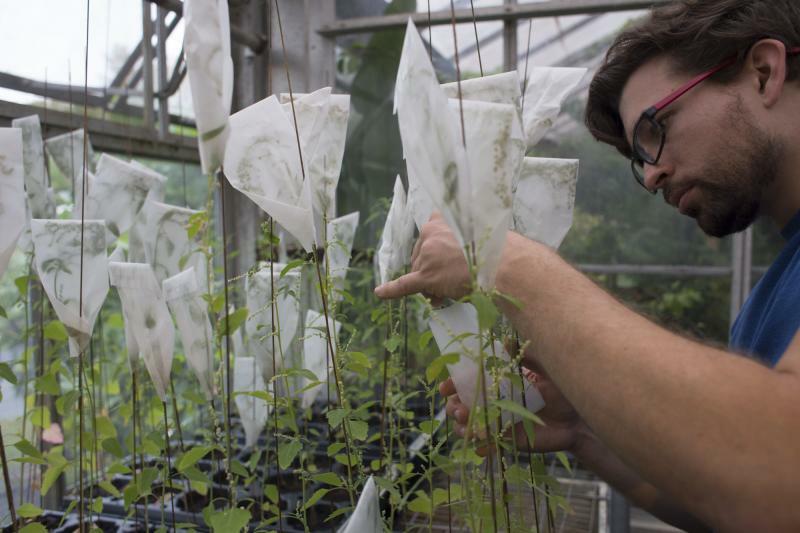 Daniel putting glassine paper bags over C. berlandieri inflorescences in the Ohio University greenhouse. Seeds are a plant's way of storing nutrients to pass to the next generation. They are packed full of a variety of carbohydrates, proteins, and oils, which is why grains, beans, and nuts are so tasty. Lambsquarters seeds are particularly nutritious and a better source of balanced protein than most of the world's staple crops. It shares this quality with quinoa (C. quinoa), its close cousin. Quinoa's popularity is no accident. Thousands of years of continuous cultivation and management by indigenous people in the Andes Mountains and coastal Chile have transformed the once-wild plant into an exceptional crop. Just looking at the seeds, quinoa's seeds are larger and have thinner seed coats than lambsquarters. Domestication has changed quinoa in other ways too. Compact infructescence and shorter branches make for easier harvesting. Seeds that don't fall to the ground on their own ensures more seeds can be harvested by farmers. All of these are part of the plant domesticated syndrome, and they are not unique to quinoa. In fact, all of quinoa's traits associated with domestication are nearly perfectly replicated in the Mesoamerican domesticate huauzontle (C. berlandieri subsp. nuttalliae). The plants have short branches with compact infructescences, reduced seed scattering, and large seeds with thin seed coats. Huauzontle is not well known outside of Mexico, though it remains a component of regional cuisine. Its immature inflorescences are eaten fried, similar to broccoli. Its leaves are eaten cooked and raw. And, its seeds are ground into flour as part of a dish similar to tamales. Chenopods growing in a greenhouse at Ohio University. In the past, lambsquarters may have been prepared and eaten the same ways as quinoa and huauzontle. The archaeological data are clear that lambsquarters was an important crop in prehistoric eastern North America, but many details about the extinct crop are hard to pin down. Where did it come from? How was it grown? How was it eaten? What is known comes from seed cashes and storage pits where seeds passed the centuries until archaeologists uncovered them. Remarkably, some high-quality samples survived, and what they tell us is bolstered by an abundance of charred seed remains. Nancy and David Asch, Hugh D. Wilson, Bruce D. Smith, Gayle J. Fritz, Kristen J. Gremillion, and others described the prehistoric domesticated variety of lambsquarters (C. berlandieri var. jonesianum) in detail with extensive conjecture on its origins. Measurements taken of seeds and broken pieces of an infructescence confirmed that the crop grown in eastern North America looked very similar to other domesticated chenopods. The archaeological seeds have thin seed coats and enlarged nutritive tissue called perisperm, just like quinoa and huauzontle. How these traits developed amongst the cultural and environmental landscape of prehistoric eastern North America is partly a question of how prehistoric people lived. I am certain cultural anthropologists and archaeologists will continue to explore that question for years to come. For me, the making of domesticated lambsquarters is not solely about the past but also about the future. Seeds collected from a C. berlandieri plant found in an abandoned lot in Athens, Ohio. Domestication is a partnership between people and other species. For quinoa, huauzontle, and lambsquarters, the arrangement took hundreds or thousands of years to develop, requiring behavioral changes of the people and evolutionary changes of the plants. In a broad sense, people guaranteed reproductive success, putting in extra work to prepare land and plant seeds. In return, the plants provided an economically superior food resource (a combination of labor, nutrition, and risk mitigation). Working out the details of the partnership does not happen overnight. It is a long process often of gradual changes which strengthen the relationship over time. Understanding of the precise human behavioral changes and the plant morphological and genetic changes that occurred in the prehistoric domestication of lambsquarters is the best chance we have to renew our contract with lambsquarters and create a modern domesticate. 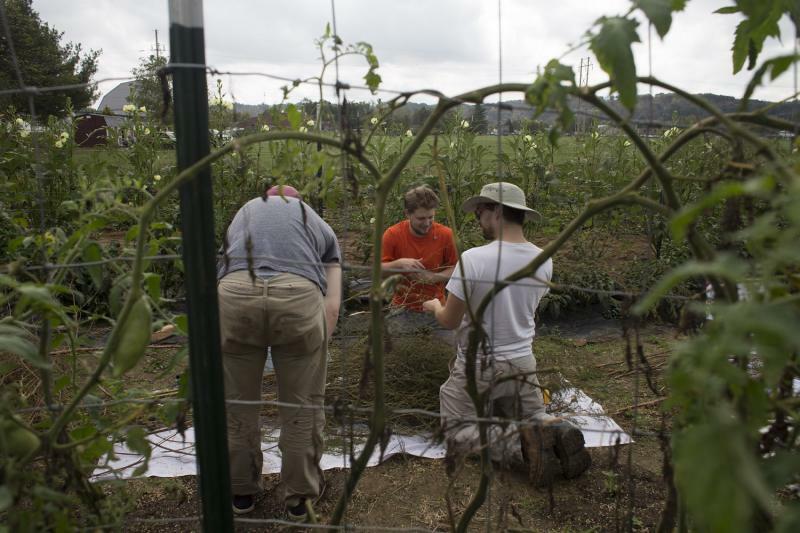 Daniel harvesting a plot of C. berlandieri at Ohio University with the help of volunteers. The morphological start and endpoints of domestication are straightforward to measure. Wild lambsquarters abounds in North America with its small seeds with mostly thick seed coats. The seed morphology of domesticated lambsquarters is nearly identical to huauzontle and quinoa: thin seed coats and enlarged seeds. The precise human behaviors which drove the evolution of the species toward these specific morphological changes can't be quantified so clearly. A number of possibilities drawn from archaeological interpretation and modern agricultural practices have been proposed. Perhaps people were intentionally sorting seeds or breeding plants for some desired goal. Unintentional pressures involving when seeds were planted and competition with other plants likely played a role. However, the importance of each of these is purely hypothetical unless there is a way to test each hypothesis. Over the past two years, I have been trying to do just that. While I could not go back in time to grab prehistoric domesticated lambsquarters or its wild progenitor, I was able to put analogs under controlled conditions to test a number of scenarios. Huauzontle is a good match for the morphology of domesticated lambsquarters, though it may have different environmental adaptations. Wild lambsquarters is a great stand-in for the progenitor of domesticated lambsquarters. Daniel harvesting a plot C. berlandieri subsp. nuttalliae at Ohio Univeristy. Wild lambsquarters seeds are not just smaller with thicker seed coats than those of its domesticated cousins; they are also more diverse. While huauzontle and quinoa seeds are almost uniformly white or pale, each lambsquarters plant produced a range of seed colors from black to light red or even pale yellow. The color of the seeds is important because it corresponds directly to the thickness of the seed coats. Thick seed coats are made of a thick layer of dry pigments which look black. Thin seed coats have a very thin layer of dry pigments and are light in color, usually red. By separating black seeds from red seeds I effectively sorted the seeds into two groups: thick seed coats and thin seed coats. 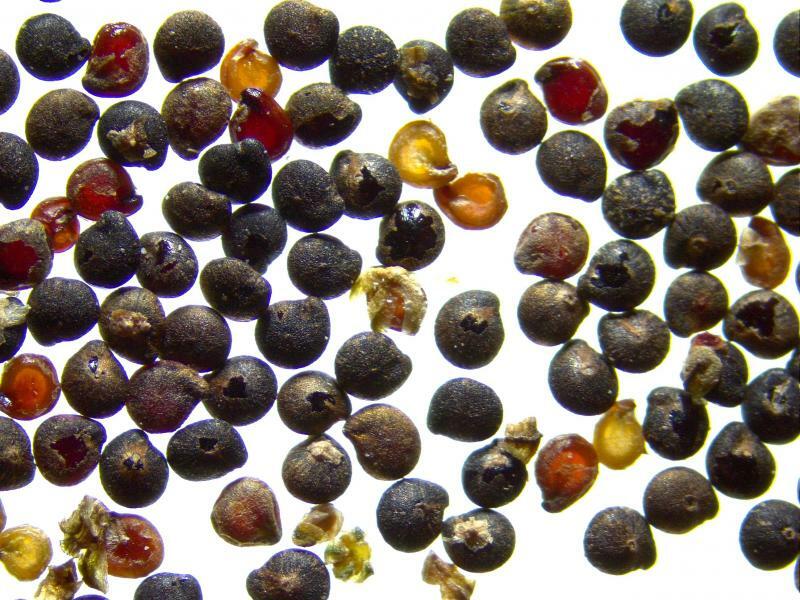 Thin seed coats are a common trait of all domesticated chenopods, so if a thin seed coat provides an advantage under human management, then the red seeds should perform better than the black seeds in certain conditions. Which conditions to test depends on how prehistoric farmers may have cultivated land and planted seeds. 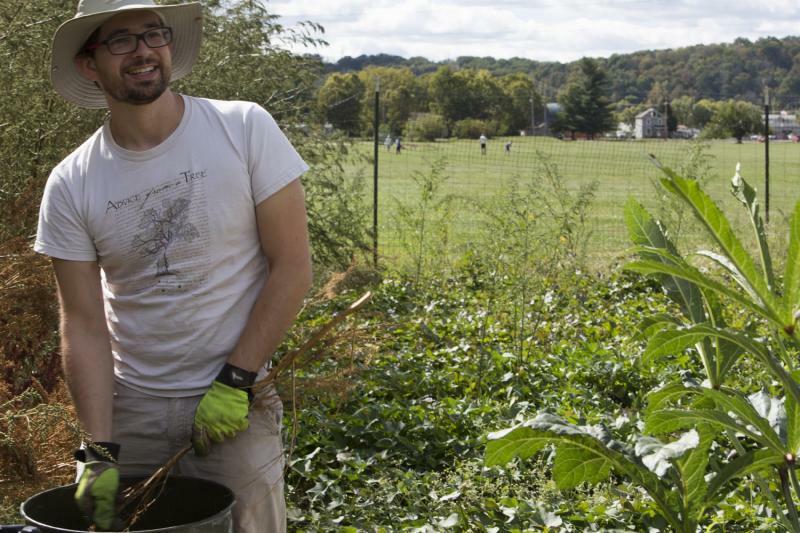 Planting seeds in freshly tilled earth and then harvesting seeds in the fall seems intuitive for most people today, but it's not the only way to grow a crop. For example, foraged foods generally rely on their own seed disbursement mechanisms, but people probably encouraged preferred species by removing competing plants. Annual species drop their seeds in the fall to overwinter near the soil surface. Tilling soil can help these seeds get established and prevent perennial plants from taking over. Species adapted to having seeds overwinter outdoors evolve to deal with the uncertainty of weather until spring arrives. They generally are very slow to germinate so that they don't start growing until the risk of freezing is past. When seeds are planted in the spring, they don't have to cope with the risk of germinating too quickly. Surviving winter is only the first challenge. Next comes competition from weeds and the other crop seeds. Seedlings that can get a head start by germinating as early as possible and growing as fast as possible have a better chance of outgrowing their competitors and producing a lot of seeds. So, I took red and black seeds from wild lambsquarters and seeds from huauzontle and tried growing them to simulate winter planting. The results couldn't be more clear. Black lambsquarters seeds are best equipped to survive winter because they require several warm wet days in a row before they germinate. Huauzontle and red lambsquarters seeds are prone to germinate on the first warm wet day. If they were left outside instead of being harvested and kept dry, this would be a recipe for germinating in the fall or a warm winter day and then dying. C. berlandieri growing under supplemental light in the Ohio University greenhouse. When I put the same types of seeds into a simulation of spring planting the opposite pattern emerged. Black lambsquarters seeds were at a massive disadvantage. Huauzontle and red lambsquarters seeds germinate within a day or two of planting, while the black seeds require two or three extra days. In that time seedlings can gain centimeters of height advantage over their slow-to-sprout siblings. 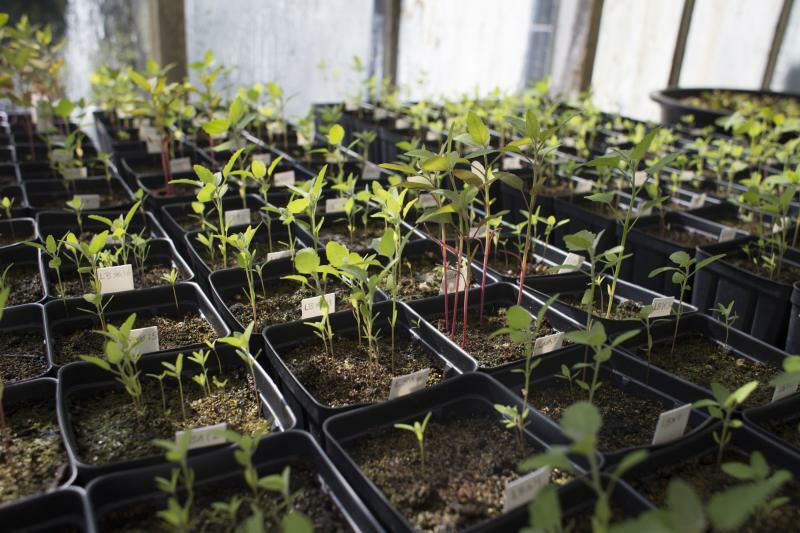 Taller seedlings have a better shot at capturing more light and nutrients, and of eventually overshadowing and out-competing slow-sprouters and other weedy competition. Quick-germinating seeds have such an advantage that, in spring-planted plots, slow-sprouters might not have a chance to produce seeds of their own. It's clear to me that spring planting is the kind of human behavior that would favor seeds with the thin seed coat morphology we see in domesticated lambsquarters. If prehistoric farmers were planting lambsquarters seeds in the spring, then thin-coated seeds would have an advantage over thick-coated seeds. Lambsquarters plants that produced a greater proportion of thin-coated seeds would likely have more grandchildren. Over many generations, an entire population of lambsquarters might produce almost entirely seeds with thin seed coats. Thin seed coats is only one of the traits we observe in domesticated lambsquarters, but it is central to understanding how prehistoric people farmed and for re-domesticating the species. When I harvest my lambsquarters plots this fall I'll be counting their seeds. I'm hoping with some careful work we can use data from seed coats to start a breeding program. A few generations or a few dozen generations of selection for higher proportions of thin seed coats might be enough to make the cultivar consistently produce thin-coated seeds that sprout quickly. 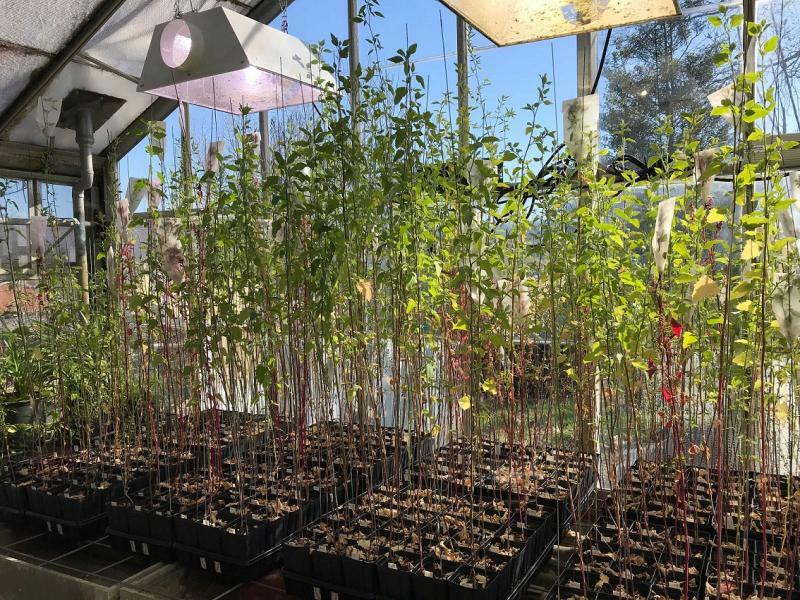 Uniformly thin coated seed is only one step toward re-domesticating lambsquarters, but it will be enough to improve yield for early adopters and those farmers and gardeners who are eager to grow a lost crop.